store excess protein, a daily intake is necessary to ensure that your body get all that it needs . soya isoflavones, calcium and iron. may help to maintain a healthy heart. levels of fat and cholesterol, such as red meat, cheese, eggs and whole milk. NUTRIFINE protein powder is a healthy choice, as one serving, provides 3.2gm of soya protein (3gm total protein). Protein is necessary for the building and repair of body tissues. It produces enzymes, hormones, and other substances the body uses. It regulates body processes, such as water balancing, transporting nutrients,and making muscles contract. Protein keeps the body healthy by resisting diseases that are common to malnourished people. Prevents one from becoming easily fatigued by producing stamina and energy. bodies cannot make them. These essential amino acids must come from the foods we eat. into smaller compounds and oxidizing these to form water, which frees quite a large amount of energy. blood sugar levels, of normal neurological functioning and of meeting all the body's various energy needs. in the metabolism of fats. )The nerve cells obtain their needed functional energy from these metabolites. at the time, whereas a certain amount of energy is used to bring the blood sugar into the metabolic system of the muscles. protein and fat molecules, when used as fuel, yield less than their total caloric value in the form the muscles can use. in the liver and adipose tissue, which supply the body's organs with fuel via the bloodstream. function or role of carbohydrates at all. Carbohydrates simply furnish our fuel or energy needs—and nothing more. fuel needs from proteins. It is stating the true fact that carbohydrates, not proteins, supply our primary nutrient needs. are normal, that they are an inevitable part of life that will and must occur unless prevented by the proper nutrients. a distinct role of carbohydrates separate from their energy-providing role. of dietary fiber in preventing diseases" are so popular and so widely made that they are practically accepted as fact. energy—and providing energy is the only role of carbohydrates in human nutrition. Blood and rusty metal are both red in colour for the same reason — the strong attraction between iron and oxygen. form red coloured compounds. In the human body the combination of these 2 elements is essential for life. whereas blood in the veins (which return blood to the heart and lungs for a further dose of oxygen) is darker in colour. Main component of haemoglobin, which transports oxygen and carbon dioxide to and from the lungs. May have anti-cancer properties . Add one provided scoopful (20gm approx.) in a glass of milk, fruit juice, vegetable juice or other liquid. for a special treat add fresh or frozen fruits and mix in a blender. NUTRIFINE protein powder can be added to any food since it is a smooth and natural tasting formulation. 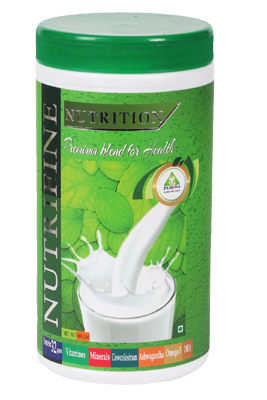 NUTRIFINE protein powder in one's daily diet,can be added in preparations such as chapati, paratha, idli,dosa etc.